Change. It’s that big scary monster looming on the horizon, and when it comes around things are strange and different. Too often people fight change, whether it be in their personal lives, work lives, their country, or the world. Changes in thought or procedure run into resistance more often than not. When change comes around, people are tempted to fight it. Many people deny change, claiming they know the old way; it’s familiar and safe. But oftentimes fighting is what makes change hard. Sometimes adjustments in thinking bring about new ideas and innovations or more efficient ways of doing things. Sometimes change is necessary or beneficial, but how do you convince yourself to accept it? When you’re in a changing environment (and if you’re in the business world, you are), you need a certain sense of resilience and agility when overcoming change. Personal approaches to change resilience differ depending on personality type, as each individual processes situations differently. Some people are naturally more flexible and accepting of shifts in thinking or procedure than others. For this reason you need to be self aware; you need to know how you’re going to react and how you can adjust your reaction. Here are some general tips for preparing yourself to handle tough changes. 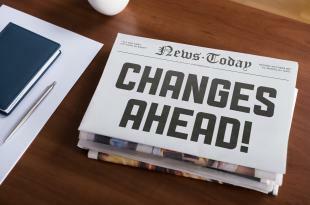 Anticipate change in your workplace and mentally prepare for it. Assess personal abilities and difficulties. If you react to things angrily, be prepared to rationalize with yourself in the moment. Understand how the transition will impact you. When a change is put into place, examine what aspects of your life it will actually affect, more often than not it isn’t as big a deal as you originally thought. Reframe unproductive thoughts and attempt to overcome initial negative reactions. When your initial reaction to procedure change is confusion or anger, take a moment to calm down, then go ask your boss why she put the change in place. In the end, you might realize that your initial anger was unwarranted. If you are implementing change and need to overcome resistance, change leadership is required. Dr. John Kotter has developed an 8-step process for leading change that will help employees accept change and work past it. Establish a sense of urgency: If others see a need for change they are more likely to accept it. Create the guiding coalition: Assemble a group with enough power to lead the change effort and encourage the group to work as a team. Develop a change vision: Create a vision to direct change efforts and develop strategies to achieve that vision. Communicate the vision for buy-in: Make sure as many people as possible understand and accept the vision. Empower broad-based action: Remove obstacles standing in the way of the transition. Generate short-term wins: Plan for achievements that are visible and reward involved employees. Never let up: Use successes and increased credibility to change systems, structures, and policies that don’t fit the vision. Incorporate changes into the culture: Articulate connections between new behaviors and organizational successes. Change is never easy, but by preparing yourself and others to overcome obstacles you are enabling your team to accept the change. This can make you both more productive and ease transition into a new way of doing things. Give change a chance!